Here’s a sweet and easy Halloween Treat Idea! 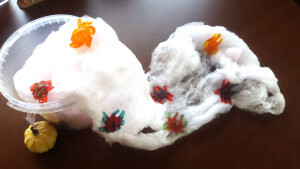 Make a cotton candy spider web. 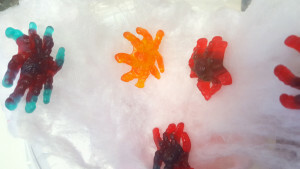 Set up your cotton candy machine and have your gummy spiders ready. 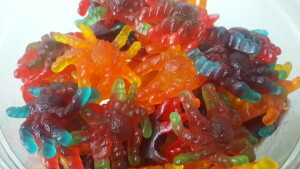 You can gummy spiders in most grocery stores around Halloween in the seasonal or candy section. You can rent an easy to use cotton candy machine from a party rental store. 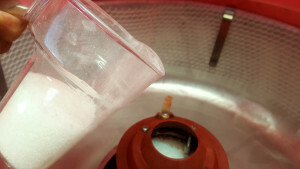 Once you turn on your cotton candy machine be ready to use the cone or wooden spoon to grab the cotton candy. Layer the cotton candy in small amounts into the container adding a gummy spider. That’s it! It’s a tasty treat for a Halloween party or to give out to trick or treaters. by the way, you can add gummy anything to switch it up.